You can also learn this art of healing all level from me. You can learn from anywhere in the world as I teach on Video too. I have trained more than three hundred students till date and God willing my Reiki family is increasing day by day. Reiki is not just a self healing technique but it is also a career path, millions of people around the globe are making their livelihood by learning this science and are not only teaching successfully but are also curing people from any part of the world. If you have a good soul, good level of consciousness and are willing to make a bright career in the field of helping people in their distressed times bringing smiles on their faces just watts app me on +917566384193 for more details. Vansh is a very bright student and Kavita is a very determined and focused lady. Both wanted to learn this technique and today they got the attenuation from me for the level 1 and 2. 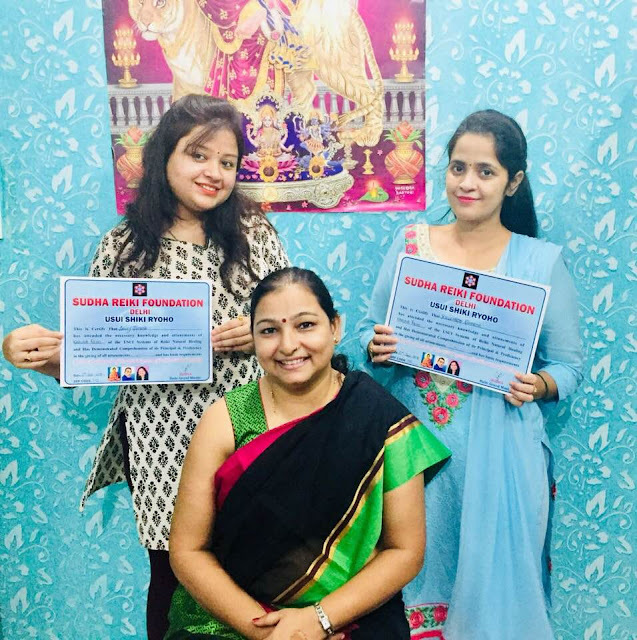 I wish them a very huge success in their future and hope they will be helping people and bringing smiles of sad faces with the power of Reiki.